Duration: 1 hour 15 minutes. (no tour on: 24-25 Dec, 31 Dec). 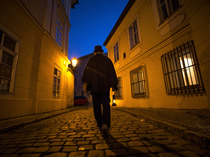 Where could be better than Prague to join a ghost tour? Come with us to discover the ghost stories and legends connected with the 'magical capital' of Old Europe. As we leave the bright lights to explore the darker side of Prague, the guide's lantern leads us through the twisting back streets and dimly lit alleyways of the Old Town. These narrow lanes and their ancient buildings conceal mysterious messages and strange, captivating tales. We visit the site of the Knights Templar’s headquarters in Prague. And we find out how, during its Golden Age, Rudolf II built Prague as a spiritual centre, a city of alchemists, full of mystery and wonder. On the tour we seek out the fading buildings and haunted churches that feature in the ghost stories and legends, and decipher the secret symbolism contained in their architecture. Prague is known as the most haunted city in Europe, for ghosts are said to inhabit many areas, but you need to know where to look! The dramatic 1000 year history of Prague means we have chilling tales to tell of murder, curses, of restless spirits that are said to wander the Old Town, and of executioners and their victims. The Prague Ghosts & Legends Walking Tour is an upbeat, fun, and hopefully scary trip. But we focus on storytelling; all the tales are real legends and ghost stories. There are no cheap tricks and no-one will jump out to scare you. So if you fancy a tour that is different from the standard historical tours, this is the one. Prague Experience walking tours are led by professional, licensed tourist guides. -a private tour, exclusive to your group. -a departure time of your choice. To reserve, mention it in Special Requests on the booking form. Guided ghost tour of Prague.